I went to check my local Walmart to see if they received any more Pokemon booster packs for me to have fun with. They didn’t. After a short while of thinking I purchased a different variant of the Fennekin Deck set and a Yvetal Collection set. I’m glad I spent a long while pondering because I actually did get many great cards to boast, share, and to add into my Pokedex card collection. Varakitsu also has a lovely Fennekin flipping coin to play around with. – Renge seems quite proud of herself. Maybe it was her who granted my small silent wish? – Three more lovely foxes to add into my Pokemon Pokedex collection! Such beautiful cards! – My third Ex card I received shortly after Virizion. Arrived after my last photoshoot to share then and didn’t want to sneak in an image in articles as that turns sloppy. – Varakitsu hopefully looking cool with the third Ex Card in my collection. – Fennekin Deck also gives me a nice online Fennekin set to play with. Awesome. – Three different types of holo cards. Partial, picture, and sparkles. – Was highly amused by the connection of these two cards. One of them focusing on Charmeleon and another on Swablu while having both in both arts. – The lovely three Fennekin evolutions from the Pokemon X&Y game. One of my favorite foxes. – If I actually battled with Pokemon cards this would be quite handy. Lovely Fennekin box. – The other side of the box looks neat as well. – I was quite hesitant in purchasing the Yvetal box. Glad I did because it’s quite awesome. – Amused by Varakitsu’s petting of Fennekin and Renge’s swiftness in posing for the camera. – Adding Yvetal to the collection in both card and display. I actually prefer Yvetal over the other legendary. – Ooo!~ Looking nice with these two holo cards. – Zorua?! Awesome! Another holo fox to add into the collection. – That gorgeous Mew Ex card! Such a beauty! – Might be someone who thinks this isn’t all that special. I do! One for being an “EX” and secondly for that brief wishing XD. – Having fun sharing the Ex Cards I have so far. – Just another day where Varakitsu goes back to plotting her numerous foxy plan while petting her new Fennekin fox. Pokemon still has that strong pull on me with something about it that just still appeals to me even a decade or more later. Varakitsu herself keeps adding on to that pull with how I can also customize her with pins while also giving her accessories to play with. She has that same effect that Perso (ex-blogger) and any other friends have. 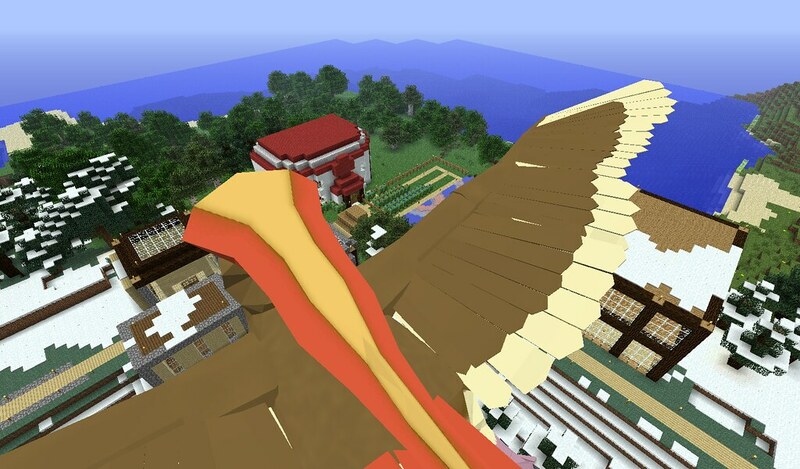 To add to that, there is this Minecraft Pokemon mod named Pixelmon that adds onto the Minecraft addiction by making everything open world with Pokemon. You start off with any of the 1-5 gen starters allowing you to then roam around the world to be a nomad or a settler. You choose what to do in your world by fighting Pokemon and trainers of varying level. You can choose what Pokemon to catch, train, what to build, and where to roam. 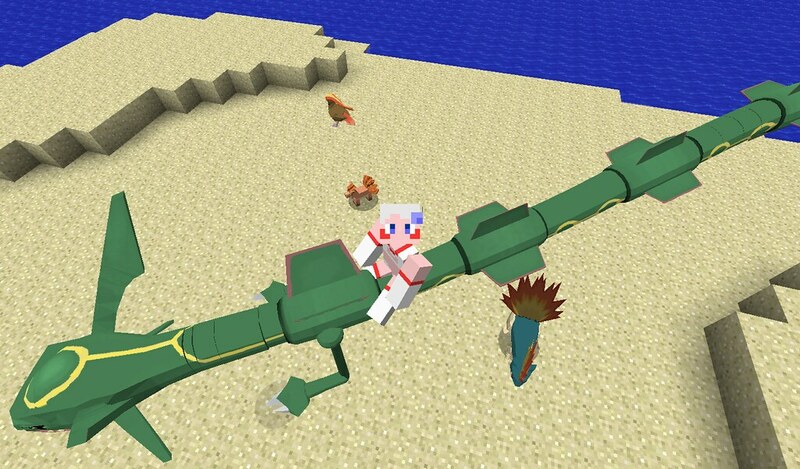 You can even choose to ride your Pokemon over land, sea, and air. If that doesn’t sound awesome then how about being able to capture Pokemon by simply throwing Pokeballs of varying types at any Pokemon of choice? It’s all awesome. – My Pokemon as of Pixelmon 3.0.2 for Minecraft’s 1.6.4 version, getting better each update. – Flying on Pokemon freely is why I love this mod so much. You can choose to play purely Gameboy game rules or to go freely. – I caught my first legendary (Rayquaza) that enjoys spawning over and over. You choose everything. 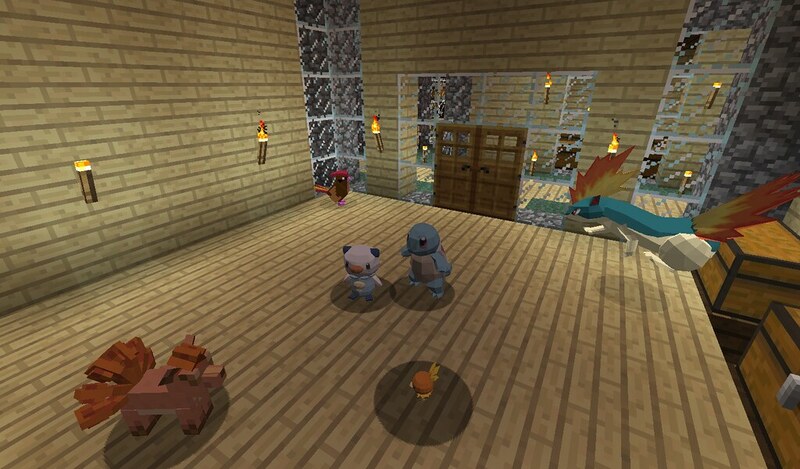 Looking at Pixelmon makes me wonder why Nintendo hasn’t made a free-roaming game similar to this. Pokemon found in specific biomes, varying levels, necessary Pokeball crafting, Pokeball manual catching, mountable Pokemon, varying roaming trainers, and having to briefly plan who to fight. You survive, fight, craft, train your Pokemon, catch, and everything else. I prefer this type of freedom in my Pokemon games, wishing Nintendo to discover a more FREE-ROAMING way to encounter Pokemon like in Pixelmon. If you haven’t played Pixelmon for Minecraft then I highly recommend you do so when you can. You won’t be disappointed. You might get bored which I then recommend you play Pixelmon for Minecraft’s 1.7.4. It’s also best played with people so find someone that truly cares about both Minecraft and Pixelmon, not some attention whore who insults games or forces opinions on you. -> http://pixelmonmod.com/ <- Go check it out. Thanks for viewing and hope you enjoyed Varakitsu, Pokemon cards, and Pixelmon portion of this article! Enjoy!